The WPC 18000 delivers a huge 17.6 kW of cooling and 15.3 kW of heating. The WPC 18000 delivers a huge 17kW of cooling and 15.3kW of heating for your large scale commercial or industrial application. 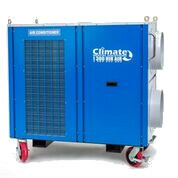 This unit operates from a 3 phase power supply and is exclusive to Climate Rental Solutions.